Clinton County Community Action has a wide variety of senior services that we operate out of The Wilmington Savings Bank Clinton County Senior Center. 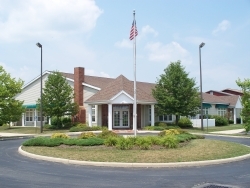 The Wilmington Savings Bank Clinton County Senior Center opened in 2001 at 717 N Nelson Avenue, Wilmington, Oh. It is a perfect location for seniors to spend time doing a multitude of activities. They can even stay an entire day, as the center operates a kitchen to provide meals to the seniors. Congregate dining is offered daily at the center at 11:30 am for a suggested donation of $2.00. This is a Title III lunch program that provides 1/3 of the recommended daily nutrition requirements of older adults. Reservations are required in advance for this service. Ala carte lunch items are also available at a reasonable cost. The transportation program provides transportation to all Clinton County senior residents 60 or older. The program provides transportation to for such activities as: medical appointments, banking, shopping, beauty and barber shop, and a variety of other needs within Clinton County. We operate a lift van (wheelchair accessible), two 14 passengers vans, and four mini vans for transporting clients. If you are in need of medical transportation, the request should be made 24 hours in advance. As this is a free service, donations are always appreciated. Supportive Services are also available at the senior center. Here you can get current information regarding social security, Medicare, Medicaid, and supplemental insurance plans. You may also get assistance with program applications, Medicare prescription plans, patient assistance programs, and Advance Directives. We have an onsite library with a wide variety of books, computers with internet access, games, puzzles, and movies. We also have social groups like: Red Hats, Early Birds, Support Group, Bridge Club, PERS, and Walk Club. Many senior services are operated through the Elderly Services Program or ESP. To find out more on what ESP is all about, please click here. Senior housing is also available to those who qualify. To find out more please see apartment complexes tab, or call Jane Newkirk at 937-382-8886.